And Selkie both diffuses the situation and provides evidence that children don’t always obey their parents! Love Tom’s expression and reaction in general to the song. Somehow I don’t see him as the type who asks things like “What the hell” all that often. I also wonder if he’s wondering, deep down and maybe not even realizing it, that there’s something to these accusations. He’s letting Todd get away with the first name basis, after all. Granted, his reaction can also be read as running further into denial, but still. No, she’s clearly evil, and thus cannot be trusted! She’s one of THEM, out to get little Tommy! I bet Lisa appreciates the song! I have that CD in my car! I am starting to feel a little sorry for Trunchbunch in regards to his son. In theory , he’s so utterly convinced that his son is a kind and respectful person, that it doesn’t even occur to him that, even with what happened at his last school, and events at this school that his son might not act the same way at school as he does under the watchful eye of his parents. Though….I don’t feel too sorry for him; he needs his perception re-centered. I’m kind of the opposite–I’m starting to feel more sympathy for Tommy, because he’s still a young kid and it’s becoming crystal clear whose fault it is that he thinks and behaves the way he does. Tom is perfectly deluded about the way he has raised his son to be. I was hoping to see Trunchbull get the big reveal today. Maybe monday? Knowing Dave, he’ll probably drag it out as long as possible. Again with the “dragging out” in the comments. I’ll reiterate what I said to WebKilla, Dave not only needs to write for current readers, but once that come in later and read through the archives. Which means yes, sometimes stories will go one longer than it seems the should. This isn’t a bad thing, this is just a thing that has to happen for stories. Not to mention that there’s more than one angle to see. Sometimes you have to go back or cut to another scene for things to make sense, or to show things fully. In this scene between Trunchbull and Todd, we’re seeing just how far the father’s disillusions about his son go. Yeah. There’s hints, we see aftermath, this is the first time confirmed. Not to mention, this scene also shows the parallels between the father and the son. So it’s not being dragged out. The story is paced. And it’s paced for a reason. Such thing s are ok for a web comic but if Dave needs to keep the format in a way that it will fit for printing if the books sell well. Or he would have to cut pages for the print format and that could change how the story is seen. I have to admit: I’m not buying this. I can easily imagine a parent who refuses to believe that their own child would do mean things – easily. But when several school staff members claim the opposite THEN A PARENT DOES NOT HAVE AUTHORITY TO SILENCE THEM. I say this having worked as a teacher and having dealt with ornery students myself. This situation is simply too stupid for it to be plausible. Sure, a parent could try to sue a school for libel – but all a school would have to do to get that thrown out of court is band up its teachers/witnesses and tell what happened. Hell, set up a security camera, or use a voice recorder to get a confession on tape from the offending kid – the boy clearly only seems to act ‘nice’ when daddy is around. It would be SO easy to wrap this up. I cannot see why this arc has to be dragged out like this. It’s “dragged out” because it’s a storyline. Writers put a lot of work into making a story work and drawing it out so that it comes to a nice conclusion. Also, if this was wrapped up quickly, there would be no story. Not to mention, one overzealous parent CAN make a system be quiet. I was working in a preschool and I got written up for putting a child in time out for biting someone. So yes, even if a child is in the wrong, staff can get punished if parents get angry enough. I’ve been on that end of it. Not to mention, a lot of schools have a “no cell phone” policy. Which makes recording a bit difficult because whipping your cell phone out is just as likely to get you in trouble as the student being recorded (yes, Selkie is likely to get punished for recording if she used a phone). So no. This story is not “dragging out”. It’s being played out. Keep in mind that the writer not only has to write for current viewers, but future ones as well. If you read through this five months from now, it won’t seem like a long story at all. Pacing is a thing that needs to happen. Not just for short term, but long term as well. To further add on. Recording in the moment is a difficult thing. For one, all it would take is one good hit from Truck to destroy the evidence collected. And then you also have no evidence that Truck destroyed the recorder. And cameras in schools could happen, yeah. However, teachers are not paid nearly enough, and so to add the cost of cameras to schools would be a headache. Not to mention, everyone on staff then has to be prepared at a moments notice. There is no warning when someone decides to start bullying. So your plan hinges on Truck not catching someone recording him and not destroying the evidence, or the school using a large chunk of it’s budget for cameras. To further add on to your comment about “this is too stupid to be plausible”. Not only did I get a write up for putting a kid justly in time out. But in my town there was an incident where /one/ parent got a preschool shut down. Why? She was angry at one of the teachers. So even with courts and things like that, yes, a parent CAN silence a system or get people fired. There are also several cases of bullying that goes unpunished all the time. My little sister was bullied so bad (from students AND teachers), she was put into homeschooling. And no one was punished. No. One. So this is a VERY plausible situation. Just saying. As a veteran reader of webcomics, this isn’t even the first multi-year two-week storyline I’ve read, so maybe I have a better tolerance for this sort of thing. Imagine reading a comic where they collect the first issues and add a bonus story which takes place later in the timeline, which teases certain things they have planned but doesn’t spoil anything. Then it takes them over a decade in real time, during which they switch over to a webcomic schedule and publish webcomic versions of every other comic they ever did that they still had the rights, to get to the point where the bonus story takes place. And we still have never even met Trelawny Thorpe in “real life”! Still, it’s free and regular. You don’t have to wait over a year for the next bit, and it only takes a few minutes of your day, unlike actual books. I know that feeling, when I saw the tears in time and those creatures in them I squealed in delight as I saw the connection. But that’s one thing I love a good webcomic can keep you hooked and reading through it all, even if certain plots are stretched so far that you forget about it. I’ve read other comics where they didn’t really bother to stretch things out but instead going from one thing to the next at a much faster pace and the problem with it for me was that it felt as if after a time the author began giving us the same thing over and over again even if the situation was different. There were no solid moments that left you feeling as if the character was growing as a person. 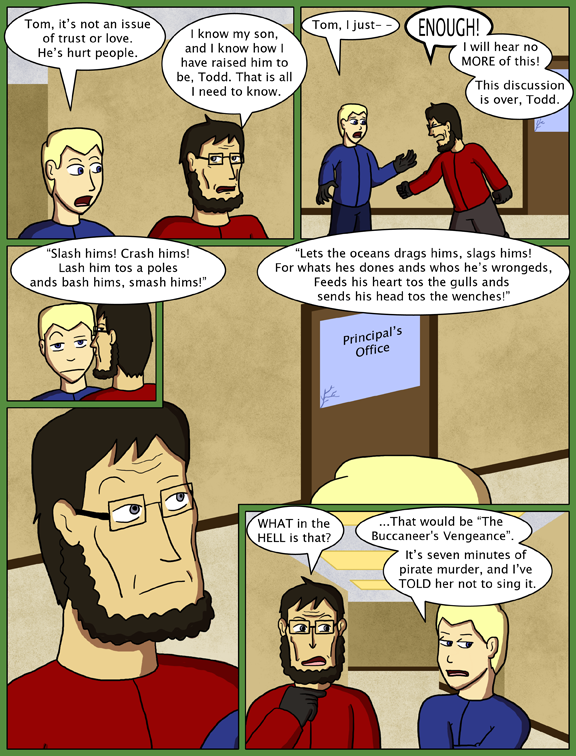 Basically it feels like it’s been reduced to a gag a day webcomic and I’ve given up on plenty that took that route. If you don’t like it, don’t read it. There is nothing forcing you to be here. I’ve started many comics, and after reading for a while decided there was something about it I did not like. Instead of complaining, which would do no good anyway, I just deleted the bookmark. I’d prefer to wait and address plausibility concerns after the whole scene is wrapped up. But as to the dragging out criticism, it’s not really an intentional thing. It’s just pacing, and arriving at points in the narrative while also making sure to establish precedents foreshadows and other information. And frankly, it could have been longer. A while back I mentioned in the Transcript side-commentary that the Library confrontation was originally going to be a bigger physical altercation, with Selkie jumping over bookshelves and playing hide-and-seek with Tommy the Truck (hide and seek for your life/well-being, anyway). We’d probably only just now be getting out of the library if I had kept that in. It is also germane to this sort of thing that we do not experience the flow of time at the same rate as events in the comic. For us, there are days between updates which could cover anything from a few seconds to hours, days, or other arbitrary intervals within the bounds of the story. This may somewhat skew our perception of how long something has been going on. As to plausibility, I must report that, as others do, I regrettably find it quite plausible. People like the Trunchbulls do not require the authority to do anything, they need only speak loudly and long enough, often enough, that people get in the habit of taking the shortest possible route to not having to stand in front of the oncoming Trunch. Rarely is that route the correct one, because such individuals are rarely concerned with what is right so much as what is righteous, at least in their own view. Yes, it would be easy to wrap this up, but part of the point is that up until Todd and Selkie got involved, everyone who could had given up on trying to. Yeah, I find it rare that teachers see quite this much of the story and still turn a blind eye, but it’s pretty often that they take the path of least resistance. Actualy he never spoke to the school staff, only the principal who was too chicken to tell him what happened. At this point it’s Selkie and Tod’s claim against his. Now that’s my kind of music! You’re right about one thing, Trunchy. Your son is exactly how you raised him to be, and I’m looking forward to you hearing that from his own mouth. #1 Tom has willfully blinded himself. #2 Tommy is actually acting in a way he thinks his father would approve of. Yes, of course sometimes children don’t act way way we tell them to act, as in how Selkie is singing a song Todd told her not to, but sometimes they act because they’ve learnt lessons we didn’t know we were teaching them. Children learn from the examples we set. Tommy is a bully because his father is a bully. An elitist, intellectual bully for sure but still a bully. Tommy respects his parents and acknowledges them as authority figures. They are the ONLY people he acknowledges as authority figures. Because Professor Trunchbull has never witnessed Tommy’s defiance of other authority figures first-hand, he unknowingly reinforces his son’s belief that Professor and Mrs Trunchbull are the only authority figures worth acknowledging by siding with his son every time the boy gets into trouble. It’s an understandable and arguably admirable role for a parent to assume; it’s just having negative consequences. 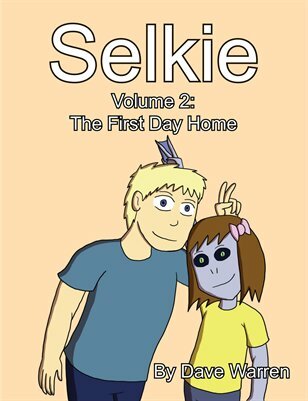 hay Dave I love selkie its a kickass comic and who knows it may someday get picked up to be a cartoon series and I have an idea for two new characters for you come if you want to know just tell me if not that’s ok and you rock. If you’d just like to share your ideas I’d be happy to look at them, but I won’t really be able to implement fan-made characters into the comic itself. Thanks, though! your welcome and my two idea characters is just something I have been thinking for fun the first character is a very honorable warrior you know like a japanese samurai and he is one of clan sar’teri best warriors and the second character is a jin’sorai woman who backstabbed the jin’sorai for her life and for power and she is know in her clan as the mad artist because of her sick art she is all so a warrior thanks to her dad who was a powerful warrior for the sar’teri clan but he is dead so the sar’teri clan are mad about all there’s sarnothi people leaving and becoming refugees and giving the U.S.A sarnothi secrets but they know they can not do something about it because of the military retaliation threats they have gotten but the come up with an idea they send the two warriors honorable warrior and the mad artist to kill sarnothi refugees and to make it look like they were killed by accident or by some humans well that my isea what do you think please tell me. I love that song. It’s dark and creepy and angry, and just the SLIGHTEST bit vengeful. In much the same way that the Count of Monte Cristo is just the SLIGHTEST bit vengeful. It kinda fits the situation perfectly from Selkie’s point of view. I would listen the crap out of that song. Regarding Professor Trunchypoo: MY GOODNESS, aren´t there any limits to how deluded one person can be? I mean, isn´t he a professor of some social science something-or-another? Where did he get his degree? Found it in an easter egg, or what? Box of cracker-jacks. It’s classier. Like where Yogurt got my Schwartz ring from. Mr Truncbull considers himself perfect. Only other people make mistakes in raising their children. He can not see that he has passed his superiority complex on to his son and how it will clash with the real world. Unless he is a true master of denial this situation should cause him to reevaluate his perfection, hopefully to make him a better person. Doubt it. I have a roommate who constantly tries to pull the “challenge” card whenever I correct him on something, or tells me flat out to stop correcting him. This is a man that I respect enough to not want him to make a jackass of himself, but lives in gleeful delusion where he can do no wrong, and anyone who “challenges” him is trying to emasculate him. I feel like Selkie would like Alestorm.